So What is The TR7? A Car Before Its Time? The Wedge shape of the TR7 caused much consternation amongst the motoring press when it was first unveiled to the public in late 1974. Even today, over 25 years since its launch, the last of the TR marque is still an object of ridicule for some people - in the UK Jeremy Clarkson (a presenter on the BBC programme 'Top Gear') is one such notoriety who likes to lambast the vehicle. Mr. Clarkson also writes for The Sunday Times (UK), so drop him a line and maybe you'll set him off again! Looking at the success of the rear engined Fiat X19 and, much later, the Mk1 Toyota MR2, perhaps there was not much wrong with the styling. The pop-up headlamps (which I believe are now banned on new cars, in the EU, for safety reasons) were an eye-catching feature and continued to be almost a 'must have' on sports cars right through to the late 1990's. Pop-ups featured on many mass-market vehicles - plenty of Toyota's (even a Corolla! ), Mazda MX5, the Ford Probe and even a Volvo.... obviously 'pop-ups' are now a plague of the Internet - but not on this site!!. The TR7 was one of the first, mass-produced cars to feature a plastic moulded dashboard... well we all know that that idea didn't really catch-on! The under-powered 2.0litre 'slant 4' engine. And the horror of a fixed-lid! It was probably the fixed-lid more than anything else which really stuck in the throat of the TR purist; many also saw the drop in top-end speed and poor 0-60mph times - when compared to the TR6 as a backward step. However with any engine much larger than 2.0l likely to hit political problems (not to mention the fuel-crisis) in the USA and the, relatively, unreliable 16v engine used in some TR6's there were not many options open to them without going seriously over budget - which was not a viable option for cash-strapped British Leyland. In hindsight the 'unreliable' 16v unit would not have impaired the image of the TR7 greatly - such was the atrocious build quality of the early, Speke built, models. Traditionalists and long-time enthusiasts of the TR Marque see the TR6 as the last proper 'TR'. This is chiefly due to the fixed lid of the early TR7 models and the revolutionary look of the new TR. Over time this attitude seems to have relaxed a little - even to the point where a TR6 driver waved to me as I sat behind him in traffic!! Is this because those people now realise that the TR7 has made a valuable contribution to the TR range? Or maybe is it just because it's another Triumph that's still on the road? Indeed the only non-true TR is the TR8!! Had British Leyland followed the naming conventions, used previously by Triumph, this car would have emerged as the TR7a; leaving the TR8 available for another body styling! The TR7 nowadays still doesn't look all that dated - certainly not its 27 years! Indeed the DHC looks as if it may have rolled off a production line just a couple of years ago, more so if it's been fitted with larger, more attractive alloys. Probably the only thing that marks the car out, as being a product of the 70's, is the rear light clusters and the panel that holds them; the rather small headlamps and the tiny sidelights..... and we'll ovelook the tartan interior!!! The demise of the TR7, in 1981, also saw the end of the British sports car - until the revival of the MG (with the MGF) in the mid 1990's. And so it looks as if the Triumph/MG debate has come full-circle. In the early 1970's many meetings/discussions at British Leyland revolved around whether the 'bullet' would emerge under the badge of MG or that of Triumph. It appeared as a Triumph and MG lived on in the rather sad form of 'performance' Maestro's, Montego's and Metro's!! (Be thankful Triumph only had to endure the Acclaim!). Leaving aside workforce and quality issues perhaps, instead of poking fun at the 'wedge' and critising British Leyland for not producing a 'true TR', we should congratulate the designers for daring to produce something different. 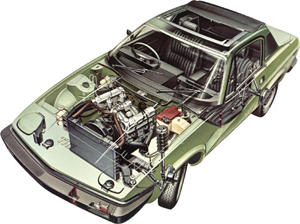 The TR7 was an innovation, it broke from tradition, trod new ground and dared to be different. Whatever journalists may say the TR7 was not the death nell for mass produced British sportscars, nor was it the catalyst for the demise of our car industry as a whole. Sure the build quality may not have helped things but poor build was something that was endemic throughout the British car industry at the time.! As for the styling if you think the TR7 was bad spare a thought for those driving family cars from British Leyland throughout the 80's!! Who owns the 'Triumph' name now? This was sold to BMW when they acquired Rover, and wasn't part of the deal which took Rover back under British ownership. Rumours have been rife that BMW may use the TR name on a sports range in the future, some have suggested that the Z3 was nearly a TR! For the immediate future though it looks as if the TR name will remain part of motoring history and unlikely to rise in a similar fashion to the motorbike which bares the Triumph name.